I don't usually post about a film I haven't seen, but this one looks so tantalizing I just had to! And Music Box Films, in conjunction with the Portuguese National Tourist Office, is offering a trip to Lisbon for one lucky winner! 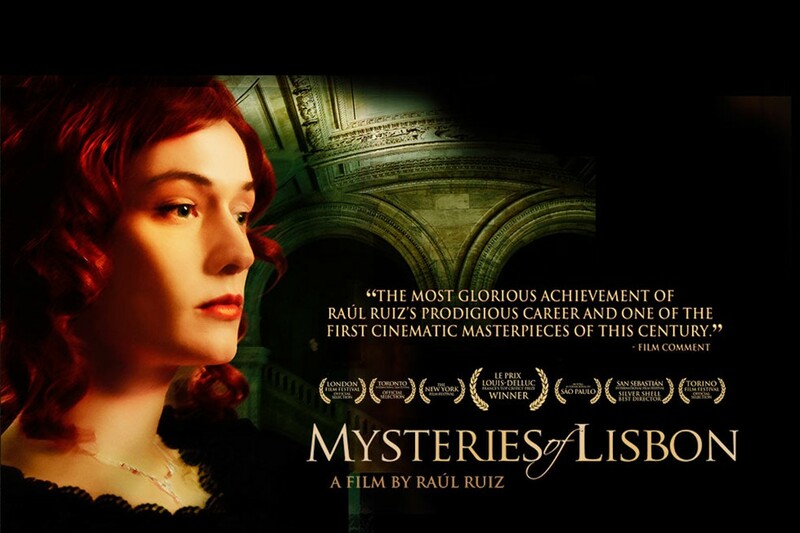 Music Box Films is preparing for the U.S. release of Raul Ruiz' Mysteries of Lisbon, the adaptation of the nineteenth-century Portuguese novel by Camilo Castelo Branco . The movie has been described by Stuart Klawan in a review for The Nation as a "wonder, heartbreak, illumination, laughter, sumptuous sets, gorgeous costumes, flamboyant acting, lavish storytelling - carrying you into a Neverland of cinematic bliss." If you love historical fiction, nineteenth-century novels, period dramas with gorgeous costumes and sets, you might want to check out this film! Raul Ruiz's masterful adaptation evokes the complex intertwined narratives of Victor Hugo and Charles Dickens. Mysteries of Lisbon plunges into a whirlwind of adventures, coincidences, revelations, vengeance, betrayals and love affairs, wrapped in a rhapsodic voyage that takes us to Portugal, Spain, France, Italy, and as far as Brazil. Evoking the complex intertwined narratives of Charles Dickens, the film's central character is Joao, the illegitimate child of an ill-fated romance between two members of the aristocracy who are forbidden to marry, and follows Joao's quest to discover the truth of his parentage. Nothing, and nobody, is as it/she/he appears in this intoxicating spiral of stories within stories within stories, filmed by Ruiz with gorgeous period design, a fluid, pirouetting camera, and a stellar French and Portuguese cast including up and coming actresses Clotilde Hesmé and Lea Seydoux. The film opens in New York and Los Angeles on August 5, 2011. Click here to see if the film will be coming to a city near you! A five-day, four-night trip to Lisbon (with lodging at 4-5 star hotels) will start with a magical visit to the capital city, down the hills through historic neighborhoods of the Alfama and Mouraria. Along the way, stop to admire the monumental Mosteiro dos Jerónimos and the splendid River Tejo. Then, you will be transported back to Camilo Castelo Branco's 19th Century World - exploring magical villages and frontier castles perched high in the hilltops, learning ancient stories of heroic deeds, glorious battles and the romance of noblemen and the beautiful ladies of high society Portugal. Note: Certain restrictions and rules apply. The Coffee and a Book Chick site is not affiliated with Music Box Films, the Portuguese National Tourist Office, or any other company associated with the promotion, sale, and distribution of this film or contest. Reminder! To enter the sweepstakes for the trip, you must click on the link in the blog post to access the Music Box Films' site - a winner will be randomly determined from the entries submitted to that link, not from the Coffee and a Book Chick site. Oh well! I am not entering :) But I will be on the look out for this movie :) Sounds so good. Veens - You can enter the contest by clicking on the link, just not by entering your info in the comments here as with other contests. Hope you enter and I'll be looking out for the movie, too! Gosh, that does look like a good movie! I especially like period pieces when they take place in other countries. I'm a Portuguese (from Lisbon) and unfortunately have yet to see a Portuguese movie that completely satisfies me. My exceptions are high with this one. The trailer looks wonderful and I'm even crossing my fingers for an Oscar nod . Just hope it's not tooooo melodramatic and goes easy on the "whirlwind", especially of coincidences. Let us know your thoughts when you see it! This does sound fantastic, and the not to Dickens is what really gets me excited! I hope this movie comes to a theater near me, that way I can get a chance to experience it's awesomeness too! Thanks for sharing this, Natalie! Who wouldn't want to spend 5 days in Lisbon. Thanks for letting us know about this, Natalie! Ooh, it sounds lovely! I wonder if it'll show up at our indie theater? Lisbon is a gorgeous city! I love movies where -- nothing is as it appears -- sounds great Natalie.